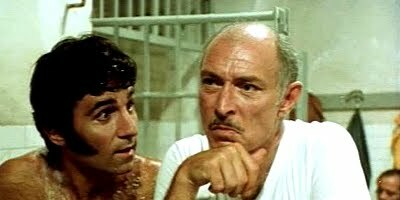 Lee Van Cleef is mean Frank, a gangster who decides to do a little bit of bird in crowbar hotel to act as an alibi for a hit, only to find himself incarcerated for real alongside crazy Tony played by Tony Lo Bianco, a mobster groupie, who has attached himself limpet-like to his hero. The demise of the gangster's brother at the hands of the mob is the pretext for a revenge movie, road movie and buddy movie. All three aspects work incredibly well. The prison segment, making up the opening third, is gritty and appears to use the same location as the castration scene in Napoli spara! and by coincidence the castrated Adolfo Lastretti from said feature is also in Mean Frank and Crazy Tony. While the road movie segment is played for laughs, often at the expense of the gendarmerie, the revenge segment finale is brutal and uncompromising as a steely eyed Lee Van Cleef blasts his way through mobster rivals running a drug smuggling operation out of a fish export plant. Romano Puppo is well cast as a mobster assassin and Nello Pazzafini equally so as a prison heavy. On the other hand third billed Edwige Fenech hardly appears as Tony's girlfriend and has a blink and it will be missed performance. Despite being woefully underused she does however have a shower scene. An alternative re-issue title of Escape From Death Row is a little bizarre for this given the absence of the death penalty, but whatever the title this is an incredibly fast paced and exceptionally good fun little film from start to finish.